Halloween is getting closer! I love Halloween. I know I have mentioned that a few times over the years and this year is no different. I already ordered something to wear for Halloween which I will share with you when we are a bit closer to the actual Holiday. I also got my little guy a baby Dracula costume which should be arriving any day now in the mail. To get in the Halloween sprit, I decided to make these adorable little Witch Hats. You may have seen them on Pinterest or various other websites. It seems most people use Fudge Stripe Cookies turned upside down for the base of the hat, but I am more of an Oreo Girl myself. 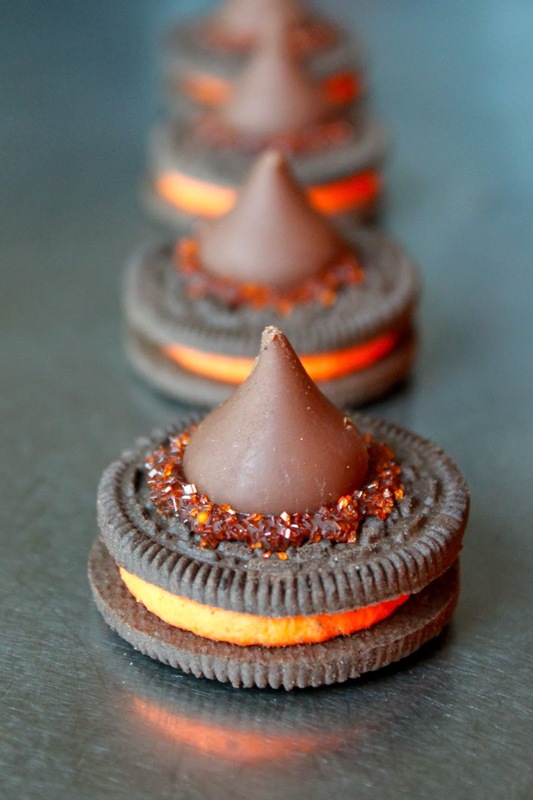 I sprinkled the edges of the kiss with a little orange sanding sugar just to fancy it up a bit. Since this is not really a "recipe" but more of an idea, I am going to just share the link to Betty Crocker, where they have instructions to create these cuties.